The Fellowes Pulsar-E 300 is designed for moderate use and is a great choice for small to mid-sized offices. 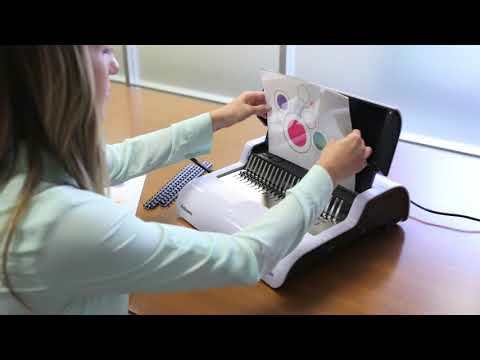 The Pulsar-E 300 Comb Binding Machine is a stylish, easy-to-use office binding system that features effortless electric punching. Designed for moderate use, the Pulsar E is a great choice for small to mid-sized offices. This compact, high performance comb binding machine punches up to 15 sheets at a time and binds up to 300 sheets with a 38mm comb. Vertical document loading ensures accurate punch alignment, and the efficient design allows the user to punch and bind in a continuous manner for maximum productivity. Features built-in comb storage tray with document measurement device for added convenience and quick set-up. Adjustable rotary edge guide centres documents with ease. Includes binding starter pack. The Pulsar-E 300 has an all metal mechanism for durability and the efficient design permits separate punching & binding. The Pulsar-E features electric punching for ultimate ease of use. There is a comb storage tray with patented document measure which allows the user to select the correct comb size quickly and a chip tray with burst out feature to eliminate jams. The vertical sheet loading ensures consistent punch alignment and an adjustable edge guide aligns sheets accurately. Included is a binding starter kit for 10 documents.